CSA member, Laura Grover, shared this recipe with us. She doesn’t eat refined/added sugar so invented her own delectable and healthy way to make a crisp. Laura wasn’t too specific on the amount of spices, apples or dates she put in, so you can experiment to suit your own tastes. Mix together the crust ingredients, and push the butter mixture into the bottom of a baking dish. 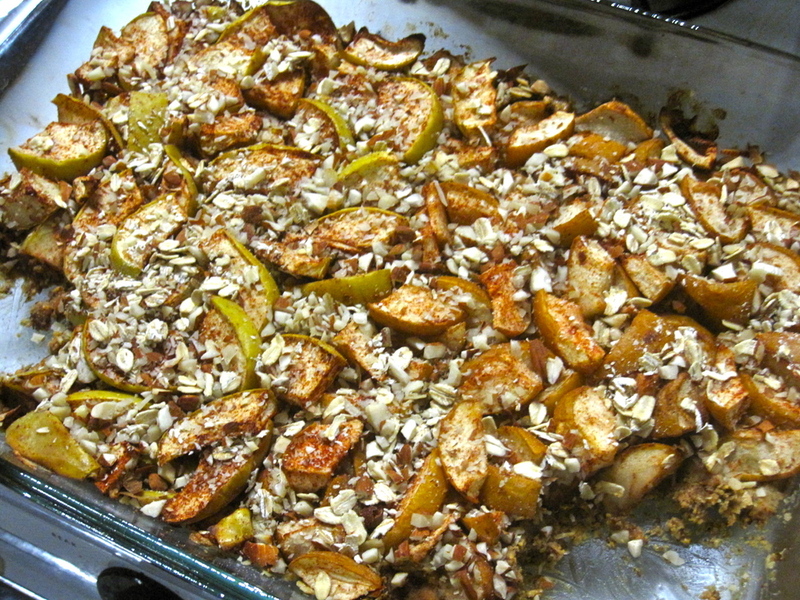 In a medium-sized bowl, toss the apple slices with the raisins, dates and spices. Spread these evenly over the butter mixture in the bottom of the pan. Then top the fruit with a few chopped walnuts and a sprinkle of rolled oats. Bake for 30 minutes. It’s amazing as is or topped with fresh cream. If there is any leftover, try it cold with Greek yogurt for a heavenly breakfast.